Every time I turn around there is another pregnancy being announced or another baby shower being coordinated. It is spring, y'all, and the love is apparently almost as prevalent as the pollen. Whether you are celebrating a first birthday, a thirtieth birthday, or just the fact that you have gone a full twenty-four hours without gelato, these popovers are the perfect way to party. We all know that I am a perpetual five-year-old at heart, and that might explain my insane obsession with all things cake-flavored. The weirdest part though? This obsession did not start until I was like, nineteen. Then, all of the sudden I was like, "give me ALL of the cake batter fro-yo." I blame hormones and a family history of very intense culinary fickleness. And by blame, I mean "thank." In light of all of that, it is little surprise that I am a huge fan of this magical emulsion right here. Cake in a bottle, folks. This is something to get excited about. 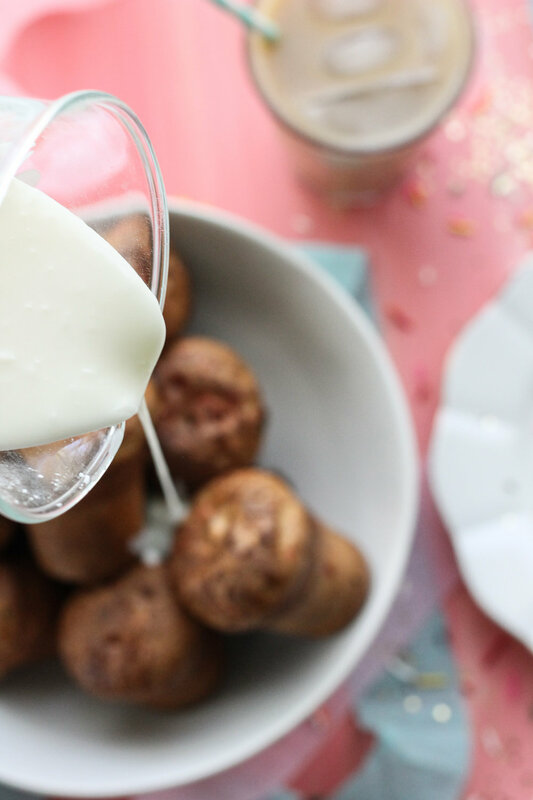 If you feel guilty about eating cupcakes for breakfast, these popovers are the perfect way to get your cake and sprinkle fix in a totally breakfast-appropriate medium. Oh, and they are made in the blender, making them so easy that you would really be crazy not to make them. Can we take a quick detour for a little confession? I used to eat party streamers as I kid. I have no idea why. I would sneak into the pantry, find my mom's box of party supplies, and shove paper streamers into my mouth. Weird. So, so weird. I think we can all be thankful that my palate has matured a bit since then. If cake batter flavoring and rainbow sprinkles weren't celebratory enough, we are making a cake batter glaze. Just a little drizzle of magic. Every day is a party. Cook's Note: While waiting for eggs and milk to come to room temperature may seem like an unnecessary bother, this is actually an important step. If the milk and eggs are straight from the fridge, they will cause the melted butter to solidify, leading to a lumpy batter. I suggest pulling the eggs and milk out of the fridge about 30 minutes before you plan to make the batter. Combine all ingredients but the softened butter in the base of your blender and pulse until smooth. Use a paper towel to rub the inside of each popover cup with a small amount of the softened butter. Remove the popovers from the oven and allow to cool for 1-2 minutes, until just cool enough to handle. Lay the popovers out onto a large platter. In a small mixing bowl, combine heavy cream and butter vanilla flavoring. Slowly add the confectioner's sugar to the bowl, whisking with a fork until thick and smooth. Drizzle the icing over the still-hot popovers and sprinkle with rainbow sprinkles. Serve immediately. Cook's Note: Popovers have a very small window of optimal consumption and need to be served and enjoyed within 10 minutes of their coming out of the oven.